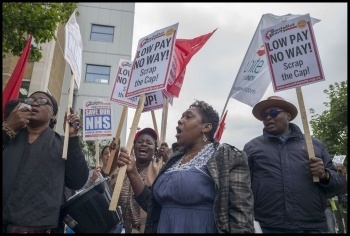 NHS workers have reacted angrily to a headline in the Guardian following leaked news: "NHS staff offered 6.5% pay rise over three years if they forfeit day's holiday". After eight years of pay freezes, in which the value of NHS workers' wages has fallen by 14% in real terms, it is outrageous that the leaked deal, negotiated by the 14 NHS trade unions "in conditions of strict secrecy", not only consists of below inflation pay rises for another three years but is also to be paid for by ministers insisting that staff give up a day's annual leave! The deal, which has still to be agreed by the treasury, includes some as yet to be published changes to the pay bands which could mean additional pay for staff not currently at the top of their pay bands. For the majority of staff who are at the top of their band it is in effect another pay cut and will do nothing to stop the drift of experienced staff out of the NHS. Much has been made of bigger pay rises for the lowest paid but the rise is only in line with National Minimum wage rises which employers need to give to meet legal requirements. 6.5% over three years does nothing to erode the entrenched low for tens of thousands of our union members. The loss of a day's annual leave will be seen as a kick in the teeth for the overworked staff working in crisis conditions due to staff shortages and underfunding. The government is said to have made the removal of the annual leave a "non-negotiable red line" during the negotiations. NHS workers should draw a red line and demand that we keep it. Last year's health workers' union Unison conference policy could not have been clearer. We demanded joint action across the union and public sector against the pay squeeze. Rather than concession bargaining in which we pay for our own pay rise we should be uniting with other trade unionists across the public sector to smash the pay cap. As the Guardian article says, the public sector pay cap was politically damaging for the Tories. This was the only reason health secretary Jeremy Hunt suddenly decide to lift the pay cap. Now is the time to hit the Tories and fight for a genuine pay rise that reverses the attacks on NHS workers' pay. This version of this article was first posted on the Socialist Party website on 9 March 2018 and may vary slightly from the version subsequently printed in The Socialist.